Beginning in 2005, Laarman turned to a software created in the 1990s by German engineer Lothar Harzheim in collaboration with the International Technical Development Centre Adam Opel GmBH. The software, which was designed to optimize parts for automobiles, mimics growth structures found in nature. As trees grow, their trunks, branches, and leaves generate to provide strength where it is needed. The Opel software offered Laarman the opportunity to generate a structure with similar properties in steel through the use of algorithms. Leaf Table, produced in 2010, was the culmination of experimentation with this process. Laarman used the algorithms to create a steel table base that provides optimum stability—giving strength where strength is needed. The steel structure then branches out into a flat, round surface. The subsequent permutations of the steel are based on the pattern of a Voronoi diagram, a structure which appears in many natural forms, including cells and bones. Joris Laarman Lab produced the steel table base with the assistance of computer-controlled laser-cutting and etching tools. The Lab then turned the steel frame upside down in a mold to cast the resin table top. To refine the design and to present the concept to his clients, Laarman created this delicate presentation drawing. Drawing is a fundamental part of his design process—he refers to it as his “meditative practice” that enables him to think on paper. This drawing for the Leaf Table shows the design in plan and elevation, with a detail view explaining the relationship between the resin and steel in the table top. Numeric text generated from the related algorithms is printed in a column running down the paper. 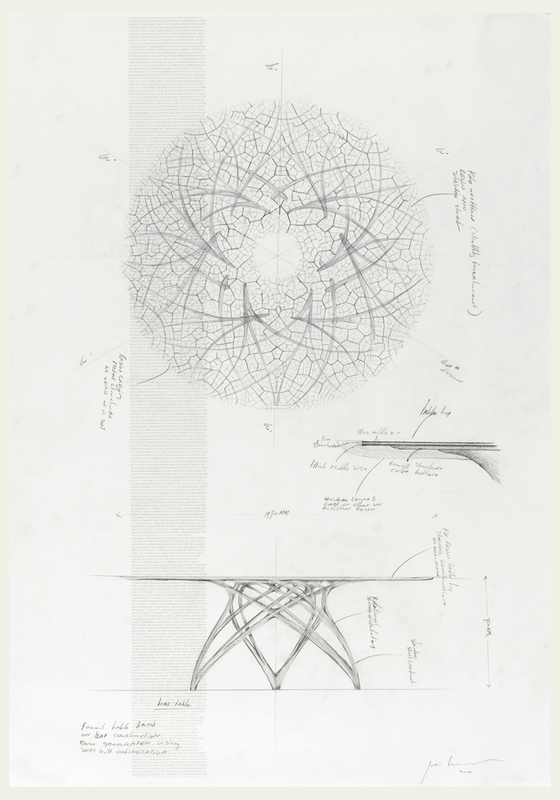 The contrast between the printed algorithms and the ethereally rendered graphite drawing eloquently balance the way in which Joris Laarman Lab look to science for both structures of creation and visual inspiration. This drawing is included in the exhibition Joris Laarman Lab: Design in the Digital Age, on view at Cooper Hewitt, Smithsonian Design Museum through January 15, 2018. Caitlin Condell is the Associate Curator and Head of Drawings, Prints & Graphic Design at Cooper Hewitt, Smithsonian Design Museum in New York. Incrível esta mesa ! Um software que permite calcular onde é necessário colocar o aço maravilhoso! Isto cria possibilidades mil para se criar com segurança.